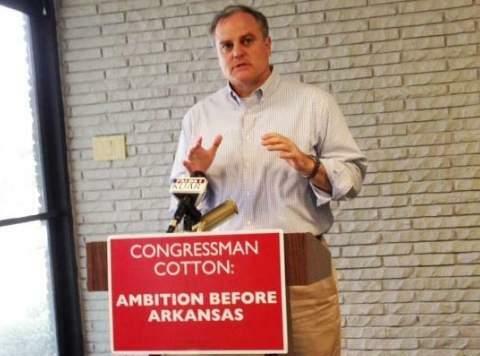 On Wednesday, Senator Mark Pryor (D-AR) doubled-down on a brazen attack on his Republican opponent, Rep. Tom Cotton (R-AR), slamming Cotton for voting against “preparing America for pandemics like Ebola,” despite Cotton having voted for the final version of the bill in question. The Senate version of the legislation included a key change addressing the concern, giving states the authority to opt-out of the “outbreak zone” designation. In effect, the Senate as a body deemed Cotton’s reservation worthy enough to alter the bill text to fix it. When the bill came back to the House with the fix in it, Cotton switched his vote, and it passed by a large margin as the first version had. Pryor, one of the most embattled Senate Democrats this cycle, has worked to use any possible weapon at hand to keep Cotton, 37, on the defensive throughout the campaign.